When it comes to wastewater and stormwater management, floating wetlants cost less to build, are easier to maintain, do not emit nasty odors, provide habitats, beautify an area, and emit less carbon. If that sounds like a no-brainer, it’s because it is. 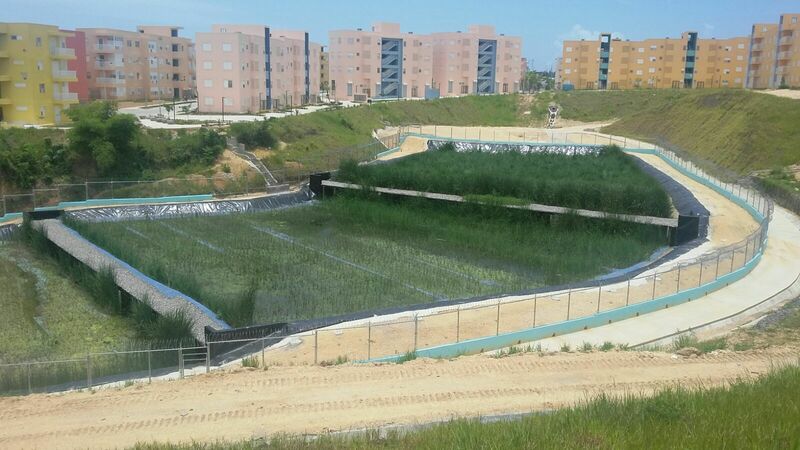 With the high cost and high carbon emissions involved in building and maintaining wastewater treatment plants and stormwater management systems around the world, natural and constructed wetlands have grown tremendously in popularity among municipal authorities and private developers. Wetlands are non-mechanical, so they create significant savings, and they double as habitats for species and help make an area more beautiful and livable. It is part of the growing field of green infrastructure. Today, one particular brand of wetland is gaining favor, precisely the one we at Integra recently built at the La Barquita Community in the Dominican Republic (pictured above), along with partner company Acua Inc. from Spain. It is known as a Green Floating Filter Lagoon, or floating treatment wetland. While useful across many conditions, they are particularly suitable for isolated areas, where traditional treatment systems are not readily available. 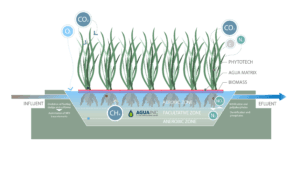 One of the main aspects of this technology is the use of macrophytes plants planted hydroponically on floating mats and placed on manmade lagoons or ponds. As reported in this recent article, floating wetlands have been shown to be superior in results, of lower cost and occupying less land, when compared to constructed wetlands for both wastewater and stormwater treatment, including in studies conducted of North Carolina floating wetlands by North Carolina State University. Here’s how they work. Macrophytes plants have a natural function as pure oxygen injectors by increasing the concentration of dissolved oxygen in the water through the plant’s permeable and internal structures. They also have the ability of aerobic degradation of bacteria associated with plant roots getting full oxidation of matter and organic gases from the sludge decanted in the bottom of the lagoons. Another key aspects of the green floating filters is the high ability to filter and retain most of the total solids found in wastewater. Floating green filters can grow about 11 ft. high and 0.008 lbs/ft2 of aerial plant mass. That allows for concentrations of dissolved oxygen in the water of between 1.2 ppm O2 over the entire surface of the sheet of water where the filters are located, and to a depth of 3.28 ft., so that the volume of water in the lagoon with highly aerobic conditions is very high. Most purification processes performed by this technology are of aerobic type, reducing anaerobic processes and eliminating almost completely the processes of decantation and fermentation, thereby avoiding the generation of malodorous gases (methane, hydrogen sulfide) produced in these reactions. 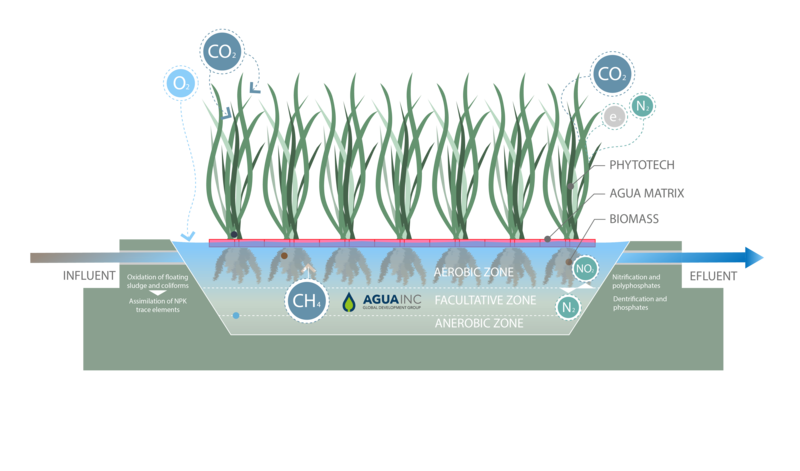 Nevertheless, such reactions are necessary (although to a much lesser extent than with conventional technologies), although no odors are generated as these possible gases are always oxidized after passing through the root zone (3.28 ft., depth, with high concentrations of oxygen) to ascend from the bottom of the lagoons to the surface. In turn, the high plant mass which is formed by growing green floating filters, will absorb, reduce and feed from high concentrations and pollutant loads of BOD5, COD, nitrogen compounds, phosphorus compounds and carbon based compounds (biodegradable organic matter and total solids). Even non-biodegradable compounds are reduced, so that the sludge and decanting over-generation can be avoided, as well as the appearance of floating crusts on the surface of the sheet of water in the lagoons. Last but not least, it is worth highlighting the high capacity of this technology for disinfection processes through the natural generation of bacteriophage substances by such plants. With the help of the high concentration of dissolved oxygen in the water, the plants remove bacteria, fungi, viruses, and insect larvae (green filters do not allow breeding and proliferation of mosquitoes) that may exist in untreated wastewater. This is an emerging green technology that has tremendous potential as a stand-alone treatment system or as a complement to conventional wastewater treatment processes. There can be no doubt that, given the significant advantages in cost, maintenance, livability and results, green floating filter lagoons will go from emerging to mainstream at rapid scale. Dwight Rodríguez joined Integra in 2003 and is Director of the Department of Civil Engineering, Permit Procurement and Environmental Studies. He has designed challenging projects in Puerto Rico, Dominican Republic and Aruba, including infrastructure master planning, water and stormwater management facilities, site planning, earthworks, and sustainable sites design.